James Burton Guitar And Car Museum - Misc. 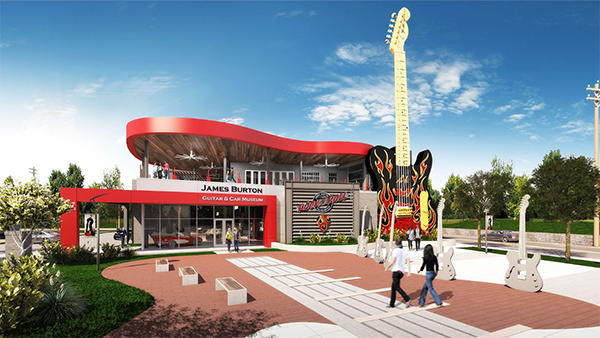 This is a rendering of the future "James Burton Guitar and Car Museum" to be located in Shreveport, Louisiana. It will showcase not only James’ highly unique guitar collection and some of his own classic cars, but will also display guitars and cars from his celebrity pals. There is nothing quite like this museum anywhere else in the world. True to the James Burton Foundation’s way of doing things, kids will play and integral part in being involved in this future project, as supporting and inspiring kids is a main focal point in what the James Burton Foundation is all about. There are plans to even have a stage located within where kids can perform. Please make sure you specify that the donation is towards the museum. Since the James Burton Foundation is a 501(c) non-profit organization, all donations are tax deductible.